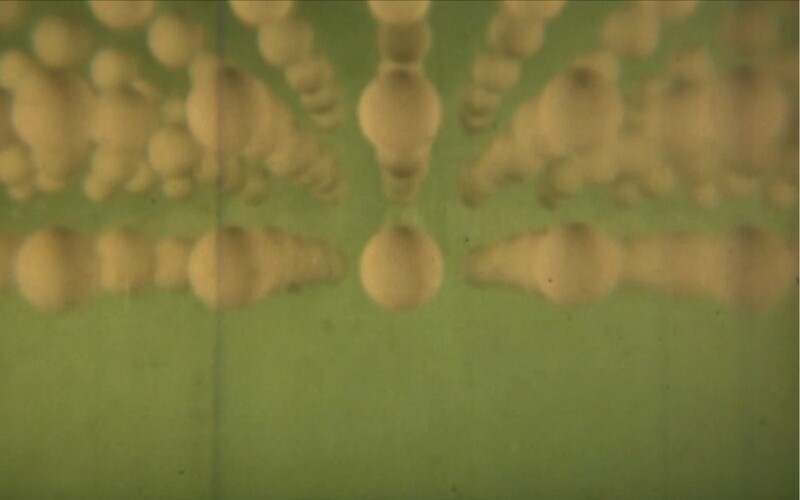 Nature of Hell is a found footage work composed from science and physics 16mm educational films. The outcome is intended to keep all the qualities of its source material, being itself a film which uses moving pictures, logically structured discourse and a narrator to bring forth to the viewer a better understanding of the given subject. Inspired by Dante’s Inferno, the work sets to explore the structure of hell and movement dynamics of human souls within it. Manipulated imagery of atoms, waves and particles become representations of souls interacting within the confines of hell. In the editing process old animations were deconstructed and put back together to serve as illustrations of these processes. Alexander Pawlik (PL), born 1984 in Chicago, lives and works in Warsaw in the field of painting, installation and different forms of moving images. Alexander Pawlik’s work is a kind of science fiction in which the alien is replace by a human. Here the artist reveals two worlds; that which we see and that which we can only come to understand. A constant experiment – like the one conducted in a laboratory, it tests the relationship between matter, space and time in parallel micro and macro scales. Pawlik formulates a visual construct of man in the universe by plotting that, which escapes our field of vision. Graduated from the Academy of Fine Arts in Warsaw. Studied Painting in 2005 – 2010, Master of Arts diploma in the studio of Professor Jarosław Modelewski. Specialization in multimedia. Nomination to Strabag Art Award. Finalist at Shortwaves, Polish Short Film Festival, Poznan / Samsung Art Master, Center of Contemporary Art, Warsaw. Took part in many exhibitions in Poland and abroad, among others International video art review ‘’THE O2” Museum of Contemporary Art, Krakow / Propaganda Projector Machine at Opener Festival, Gdynia / ”Lazy Life, Persistent Hope”, Bochenska Gallery / Washington Projects Arts: Experimental Media 2012, The Phillips Collection Washington, DC, USA / 5th In Out festival, Center for Contemporary Art ‘’Laznia”, Gdansk. Member of the group Oskar Karas (residency in Galeria Praca, Warsaw).